Spend one week relaxing in apartments, villas or Bungalows and we will have your car delivered to enable you to be free to make our "Safari Programs" individually in the eats part of Crete for a further one week. A combination program for a week relaxation in apartments and villas with car delivery either at the airport, upon arrival or at your accommodation. Live the unique experience of outdoor activities in the most beautiful sports of the wonderful Greek landscape. MAGIC TOURS plans, organizes and performs programs addresses to all Nature and Adventure Lovers. Enjoy off road (4 X 4) excursions on mountainous Idi Dikti Thrifty, which combine trekking through Landscapes of rare beauty. You will find the true picture of Crete not only in its magnificent monuments and tradition, but in its nature as well. The Cretan mountains are famous for their herbs and aromatic plants. Variety in landscapes, fertile plateaus, deep fabulous gorges, monasteries, villages, castles and lonely traditional houses and hilltops. Taste the delicious healthy Mediterranean; savour the local snaps Raki and the fine Cretan wine. Fell the magic of the clear sky, the smell of the aromatic plants, the birds flying and singing. The activities take place throughout the year, as every season of the year has its own beauty. We at MAGIC TOURS love what we do and that's why we are looking forward to sharing it with other people. 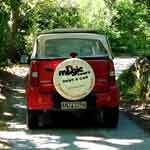 Everyone that, wish to explore and discover the hidden trails of Greek nature can participate in a Jeep Tour. The driver of each Jeep should have a driving license and be over 23 years old. 4 X 4 country cross in the Sitia province an unique experience as you will enjoy the backcountry off east part: Ierapetra, Makri-Gialos, Moni Kapsa, Goudouras, Ag. Triada, Ziros Xerokambos, Kato Zakros, Palekastro, Vai, Moni Toplou, Sitia, Piskokefalo, Skordili, Chrisopigi, Stavrochori, Ierapetra. 4 X 4 mountain cross on the slopes and the entire mountain range of Thripti A very scenic tour with ever changing Landscape green slopes and unique Flora: Ierapetra, Kato Chorio, Tripti, Afentis (Stavromenos), Orino, Schinokapsala Psychro, Ag. Ioannis, Ierapetra. It is a surprise route every time and it is conducted in backcountry roads and Scenic Landscape: Ierapetra, Elounda, Fourni, Kasteli, Limnes, Lakonia, Kritsa, Katharo, Males, Anatoli, Kalamafka, Mpramiana (Technical Lake), Ierapetra. This is a magnificent mountain 4 X 4 the scenery is changing, wild, soft Wild trees, wild flowers, goads, lamps, and the fine smell of aromatic Plants: Ierapetra, Mirtos, Mithi, Sarakina, Males, Selakano, Christos, Metaxochori, Simi, Omalos, Amiras, Pefkos, Ierapetra. 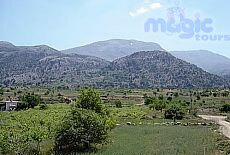 The area combines natural beauty with historical and archeological Interest with a lot adventure and beautiful scenery. Chersonisos, Potamies, Avdou, Moni Keras, Tzermido, Limnakaros, Phichro (Dicteon Andron), Exo Potami, Zenia, Ag. Nikolaos, Kalo Chorio, Prina, Meseleri, Ierapetra. Car rental for one week on unlimited mileage basis.